I found this picture of Dave and me. We took it at a mock up photobooth inside a Sephora in Times Square. We were on a date or just playing around. Probably ate ramen nearby (probably Totto ramen) or just decided to walk through Times Square because we wanted to. The date was on July 11, 2011. We had been together for a little less than two years. Let's see... We were living in our first apartment in Williamsburg and pretty content with life. Just dating and enjoying being independent adults. No plans of marriage or kids. We were maybe already shopping for apartments which was a serious move for us. We were looking at purchasing as well since paying over $2,000 for a one-bedroom apartment was pretty excessive. It's probably my fault because I just HAD to have the washer/dryer inside the apartment :) And who doesn't love having elevators?? I didn't own an iPhone back then looking at the little Spongebob phone accessory sticking out of my pocket. It was probably attached to my Sony Ericsson phone I brought from Taiwan. 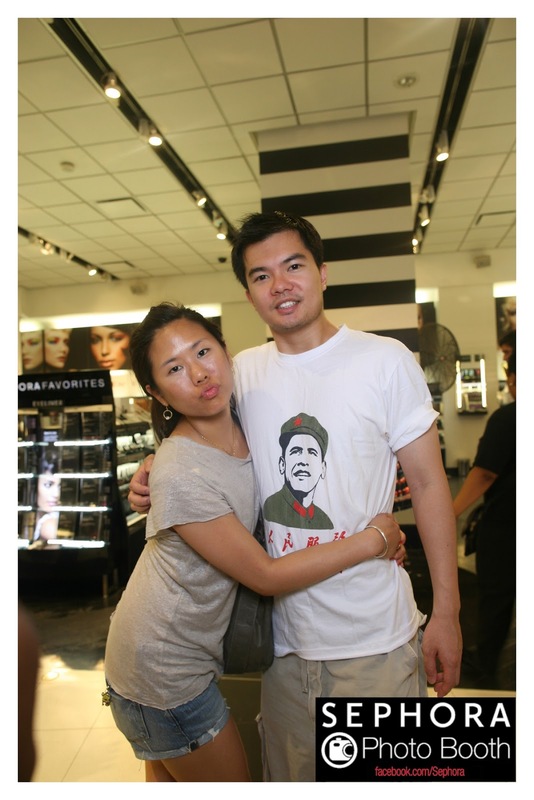 I bought Dave that Obamao t-shirt while I was in Beijing. A nice thoughtful 'buddy' gift because we were just friends before I decided to move to New York city in 2010 :) He doesn't wear it anymore though. I don't think I have discovered sample sales yet because I remember overpaying for that Alice and Olivia top at Bloomingdale's. What I did discover is shopping at Bloomies like Rachel Green. I want to look through more oldies pictures and remember my own thoughts back in that moment in time.